You’ve probably heard of it. You may have used it. But just what is this sound effects metadata thing? It’s not surprising that the word metadata is thrown around a lot these days. We’re flooded with Web pages, text documents, and photos. Metadata is a way of organizing and searching through this torrent of information. Metadata has become incredibly important to field recordings, in particular. 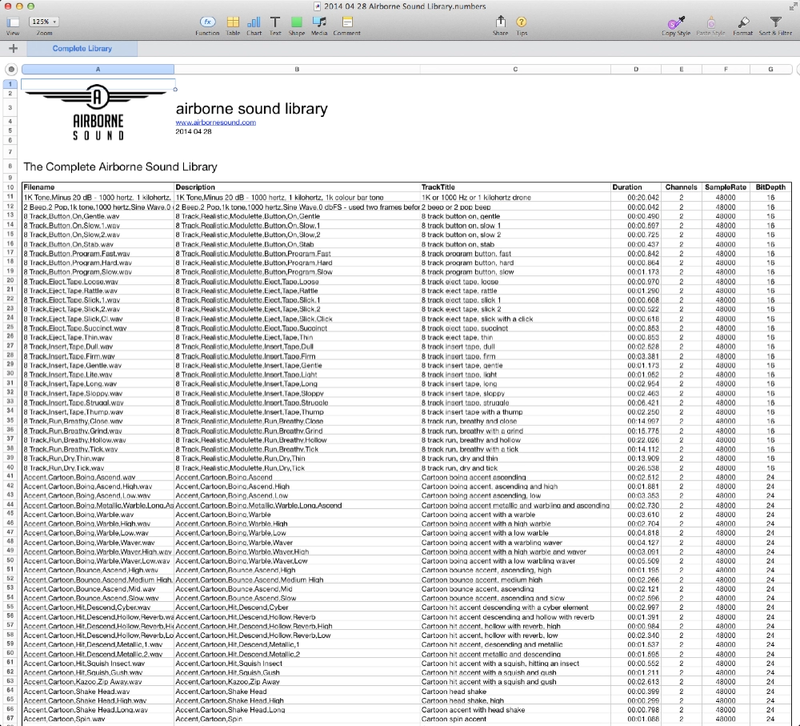 Using metadata makes your sound library more supple, and more useful. I first mentioned metadata on the site when I described how to apply metadata to the Free Firearms Sound Library. Those instructions were fairly involved, though. Let’s back things up and slow things down. I’ve also included links to other metadata articles at the end of the post. The next article will delve deeper into metadata. It will include a fresh look at how metadata affects field recordings in particular, and, later, suggested fields to use in sound effects libraries. This article is part of June’s “Metadata Month.” Join the free newsletter to receive the next article in the series. 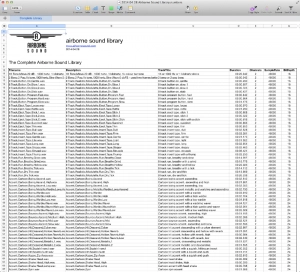 If you’re new to curating sound effects, you may have no idea what metadata is. Having no experience with metadata is normal. In fact, it’s expected. Why? We need some audio to hear in the first place, of course. Most of the time we think of audio as the most important aspect. The file name can seem secondary. It provides a bit of information (“Dog barking fiercely.wav”), and distinguishes it from the other sounds on your hard drive. …is married with the sound file. Years ago, that’s all sound editors had to work with. That was a bit limited, of course. There’s only so much information you can squeeze into a file name. There’s another issue, too: sound is linear, and duration-based. That means, in most cases, we need to listen to a sound from beginning to end, and sit through the entire duration. And back in the days of CD sound libraries, that’s precisely what you had to do. Metadata solves this problem. How? 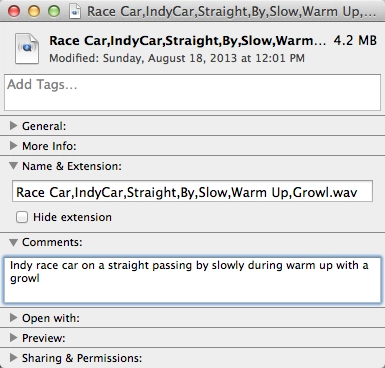 It sidesteps file name limits, and the need to listen to a sound to reveal what it is. So, metadata is information about a sound effect beyond the audio and file name itself. …And so on. Some metadata provides only a few of these fields. Other files store metadata with dozens of fields that contain hundreds of characters. Where is all this new information stored? Metadata is tacked onto the audio within a sound file. 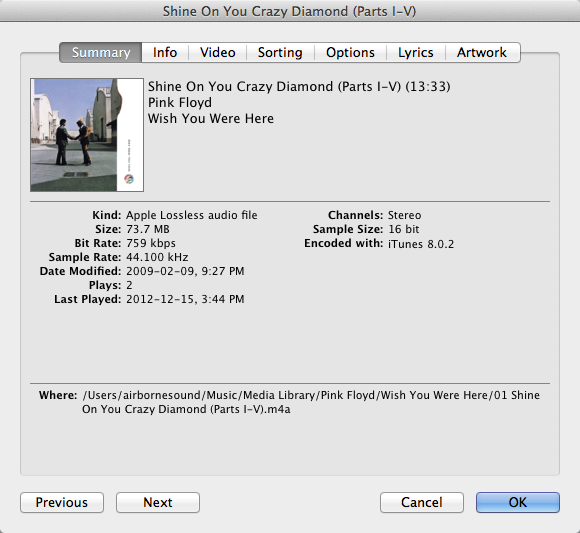 Adding metadata is referred to as embedding or wrapping metadata around a sound file. This means a tiny bit of information is affixed to the sound file itself. It gloms onto the side of a sound, awaiting to be viewed when it is needed. It’s important to note that all of this metadata is “hidden.” That means when you look at a sound file, or listen to it, you won’t have any idea it’s there at all. The metadata will only be revealed if it is viewed through specialized sound browsing apps. What’s interesting about this is that metadata doesn’t interfere with a sound effect. That means that metadata is “audience-independent.” Newbies and pros can both listen to a barking dog sound clip. However, pros can take advantage of the additional metadata tacked onto the clip. Specialized sound browsing software will reveal the hidden metadata, allowing pros to search, find, and browse the metadata. So, metadata adds more information to a sound effect. It is attached to it, but doesn’t interfere with audio playback. So, metadata is part of the sound file, but is apart from it as well. What does metadata look like? Metadata takes many shapes. Why? Well, the concept of metadata is deliberately flexible. 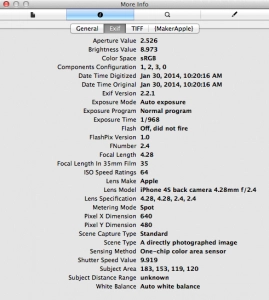 After all, metadata is more, hidden information about a thing (photo, text document, sound). So, the shape metadata takes depends on the source document. For example, photos have metadata known as EXIF which describes location, shutter speed, provides a thumbnail image, and more. What about audio? Well, chances are you’ve already used metadata and haven’t known it. Do you have MP3s? Then you’ve used metadata. MP3s store and display information about the music, such as artist, and track name. That information is not actually part of the audio, after all. It’s metadata that can only be seen when viewed in an MP3 player, such as Apple’s iTunes. 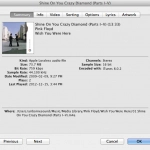 iTunes reads and writes a type of metadata into MP3 files called ID3. 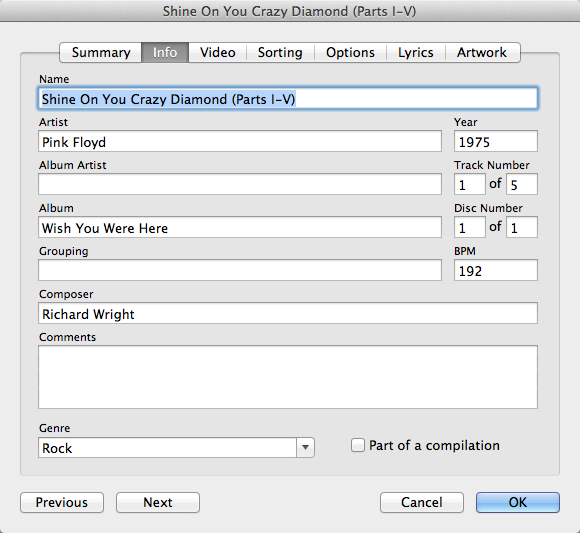 ID3 metadata includes album, album art, composer, and others. The difference between MP3 ID3 metadata and sound effects metadata? Not much. It’s mostly a matter of specialization. Sound effects don’t use metadata such as “genre.” Instead, they use other fields that are helpful in our craft: category, subcategory, microphone, and others. One example of specialized audio metadata is the Broadcast Wave Format (BWAV). This is an industry standard that attaches metadata to WAV files. BWAV is good because it is well supported. It is recognized by hundreds of gear manufacturers and software developers. There’s a downside to this, though. The precise BWAV metadata fields are strictly defined, and therefore inflexible and limited. As a response, independent software developers created their own metadata formats. This allowed sound effects to add more metadata fields, such as creator, microphone, recorder, category, and other fields that are helpful to sound pros in particular. That has allowed thousands of field recordists and sound designers to fill up these new metadata fields with information that helps them describe their creations in a way that the rigid BWAV format could not. Two important notes about this sound browsing app metadata. 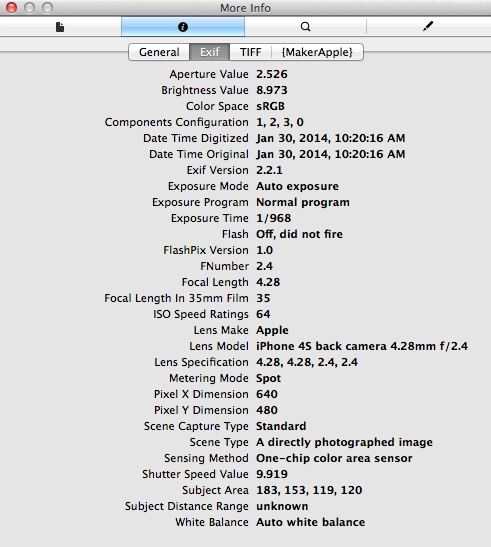 First, each app has its own list of metadata fields. 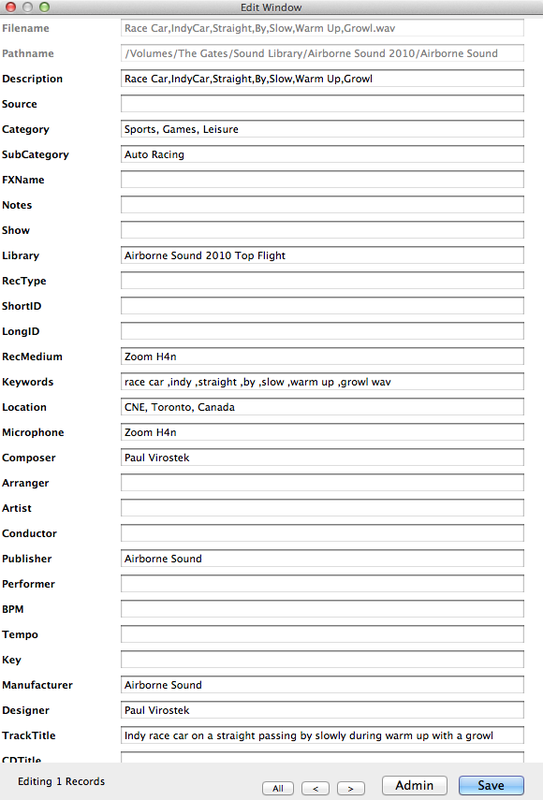 One app, Soundminer, features dozens of fields. Another app, AudioFinder, also applies metadata, but lacks a specific “Description” field. So, unlike BWAV, there is no standard between metadata from these third-party apps. There are other types of sound metadata. Operating systems can attach system metadata to sound files. For example, the Mac OS X Finder can add text notes to an audio file right in the desktop. OS X 10.9 Mavericks also allows you to add labels and tags to a sound file, which are a type of metadata as well. You can search for this text using the Finder’s Spotlight, and other apps. This isn’t as commonly used, since it’s cumbersome to apply. Save time. Metadata helps you search and find sound effects faster. Curating. Metadata helps you organize and tweak your sound library. Portability. Metadata embeds information directly into your sound file. That means heaps of information will follow a file wherever it travels, and won’t be separated from it. Library appeal. Metadata makes your library more usable to yourself, and, if you’re sharing your tracks, to other sound pros, too. Preservation. 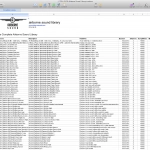 Metadata preserves crucial information about when and how the sound was captured. This is especially important for feature film or TV workflow, or archival work. Metadata also has deeper implications for field recording and sound effects in particular. I’ll get into that in the next article in the series. Hopefully by now you’ve seen how much metadata can help you. But how do you add it to your sound files? I’ll provide a broad overview of how this is done, and explain in detail later this month. Operating system comments. Add notes to the sound file using Windows (right-click, choose Properties, then Details) or Mac OS X (command-I, then Comments). A bit clunky and slow, but it works. Spreadsheets or text files. List every sound file name in text file or spreadsheet, then fill in more details in columns. Allows you to store a lot of information, but it is not directly attached to the sound files. Sound browsing metadata apps. Add metadata to sound files in batches, and embed it directly to the sound itself. Allows you to search, find, and browse this metadata easily. This is the most efficient way to add metadata, but requires buying the browsing app. I’ll explore these apps in an upcoming article. I’ll explain how to add metadata in later articles, focusing on the Soundminer app. What’s the best way to use metadata when you have it? One of metadata’s largest benefits is helping finding the correct sound effect. Taking advantage of metadata requires a bit of tweaking, however. For example, let’s say you need an ambience for a cold, arctic scene. You decide to search for “wind.” However, your search results also return clock sounds, as well as weather sounds. The search confused a clock being wound with weather sounds because they both use the word “wind.” This is where metadata helps. When you add more metadata information, search results improve. You may, for example, add a category to each sound: “household” for the clock, and “weather” for the wind. Then, when you search again, merely add the word “weather” to your search for the “wind”. That will return results without the clock. That’s a basic example, of course. 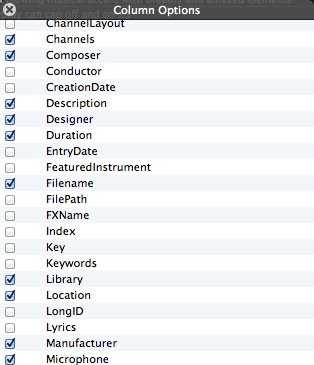 Some sound pros have dozens of metadata fields. That allows them to find sounds from a particular year, recorded with a specific microphone, and so on. Most sound browsing apps can filter results like this automatically. Others allow you to use an advanced search to pinpoint results more finely across multiple fields, excluding one term, matching another exactly, and so on. So, metadata is useful to find sounds accurately. This becomes especially helpful the larger your sound library grows. You can also use metadata to help organize your sound library. As your collection grows, you’ll find an increasing need for consistency. Ultimately, the choice is yours. However, the choice must be consistent. Search results, after all, are only useful if they are predictable, accurate, and expected. If you use a mix of terms, your searches will return only some of your field recordings. So, metadata helps you standardize your library. This makes it easy for you to search and find your sounds. Planning on sharing your sound collection? It will also help your fans, too. I wanted to cover just the broad strokes of sound effects metadata today. In the next article, I will go deeper into the impact and “philosophy” of metadata upon sound effects, and how that affects field recording and sound editing. 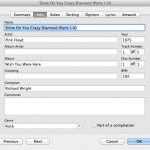 Later articles in the “metadata month” series will explore metadata apps, how to use metadata in Soundminer, and more. Join the free newsletter or follow me on Twitter to receive the next article about sound effects metadata. 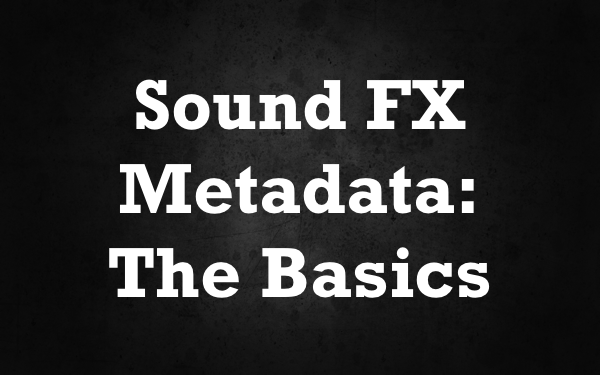 Want to learn more about sound fx metadata? I wrote about metadata extensively in my e-book, Selling Creative Sound. I also wrote a few articles about a related topic, naming sound fx (article one, article two). Finally, I published a post with advanced tips about applying metadata, and “mirroring” in Soundminer. You and your Metadata – a brief overview of metadata. Metadata support in sound library apps – explores what features are supported in popular metadata apps, circa 2010. Metadata test with Wave Agent – testing metadata in the free Sound Devices app. Frank Bry’s metadata workflow was featured on designingsound.org. 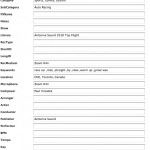 In the first “Methods of a Metadata Madman” article, he explains naming ideas. 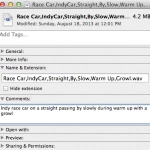 The second covers techniques to apply metadata in Soundminer. In addition to these great posts, I have two articles which discuss other methods of applying metadata planned for the future. Gareth Fry wrote an article about re-associating old CD sound fx library rips with fresh WAV files. Have questions about metadata, or Soundminer? Contact me. I’ll answer questions for readers at the end of this series.